The UL Listed CODA Core™ Tower is a fully functional energy storage system out of the box, like an appliance. It combines advanced lithium-ion battery cells, comprehensive battery and temperature management systems, and an intelligent operating system tailored to your specific application. The Tower is available in 40kWh and 50kWh of energy, and integrates seamlessly with various inverters suited to your power needs. 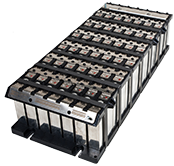 Batteries: Lithium Iron Phosphate (LiFePO4) cell chemistry, with the option to integrate other chemistries.